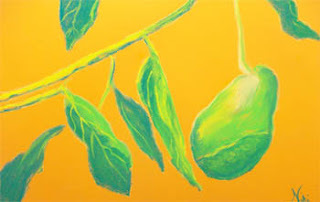 This year, I decided to enter the "Art of the Avocado" contest, sponsored by the Fallbrook Chamber of Commerce. I've been putting together a lot of avocado-themed pieces, but I couldn't decide on one for the show. 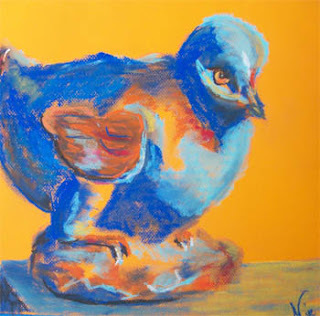 Finally, I created this one: a simple chalk pastel on Canson Mi-Teintes paper. It was different from all of the previous pieces in that I didn't include all of the details I had in my other avocado works. It's also much brighter. There are times when I find myself hating a piece until the very end, when it all finally starts to make sense. This usually happens when I try something a little different, and am not sure if the risk is going to pay off artistically or not. "Tropicale" was one of those pieces. Once it was complete, I was quite happy with the experiment. I used dark green Canson Mi-Teintes paper, thinking the green would blend nicely with the background. I thought I would try to exercise some patience and build the trees with layers of color. It quickly turned into a battle between the colors, and I was fighting to keep the trees from turning into mud. I finally realized that no matter how many layers of lights I added to the foliage, it wouldn't look right until I went back in with some darks. 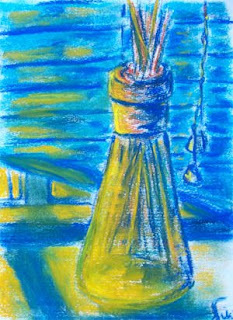 I used my almost black gray pastel, and worked in some tiny shadows to emphasize the lights. 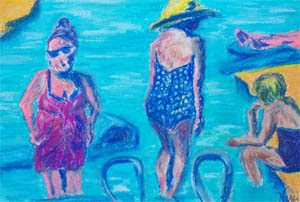 Last summer, we spent a day at the beach at Aliso Creek. I don't normally go to Orange County beaches, being partial to San Diego. 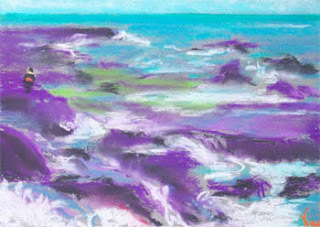 I did get some great photos of the rocks and cliff at this beach, though, one of which inspired this painting. This group of rocks looks particularly inviting, with lots of flat areas. It has a large sign warning people to stay off of the rocks, probably because they are constantly bombarded with waves and most likely slippery (see the green in the upper half of the painting). Throughout the day, the lifeguards repeatedly had to trot out to the rocks and tell people to go back to the sand. Finally toward the end of the day, they drove over to the area and made a loud announcement on the speaker, reminding people to stay off the rocks not only for the rest of the day, but the rest of the summer. It was pretty funny. I tried to keep this one light and loose-- it was on small paper. 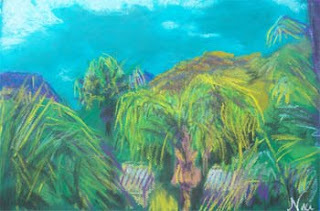 I've painted this subject before, with acrylic on paper in one of my classes at UCR. In that attempt, I was focused on pattern and texture, and had a much larger piece of paper as a surface. Knowing from experience how much "information" there was in the reference photo, I reminded myself to stick to my basic impression of the place and not muddle around in the details. Keeping a light touch and focusing on lights and darks helped me do this. If at first you don't succeed, try another medium? 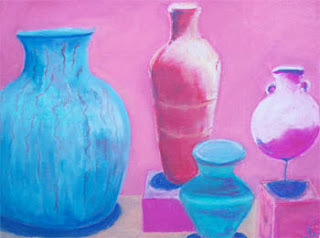 More stylized pots... this piece was about working big and enjoying the medium of pastel. I used another reference photo of some Ancient Egyptian pots, and knew that for this piece I wanted to play with different red and green based hues (particularly scarlet and teal). 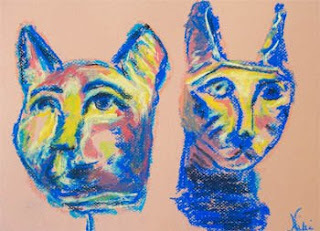 I have an extra soft set of pastels, and those seem to work best with these bright color combinations. 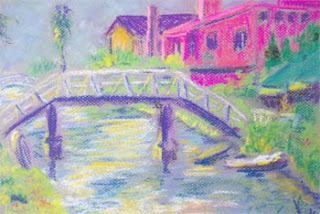 The focus on color took away from some of the value (lights and darks), which gave it more of a flattened look. Normally I would feel the need to work those values back in, but I knew I would lose that emphasis on color if I did so. I've taken many photos of the beautiful scenery at Glen Ivy Hot Springs in Southern California. I've never felt comfortable snapping random photos of people, although the spa patrons are really the most interesting subjects there. I don't like to ask people if I can take pictures of them, because then they pose and it doesn't look natural. On the other hand, I don't want to be that creepy person that randomly walks up and takes pictures of people without their permission. It seems like every once in a while, one of the old masters comes back into society's consciousness. Suddenly, that artist is everywhere, and try as you might, you can't escape seeing his or her work. I've noticed Paul Gauguin popping up in articles and web forums lately. It seems like he's not only a hot topic because of his work, but also because he was highly skilled in the art of self-promotion.